What a city. I had the opportunity to work in this city in summer a couple of years back. 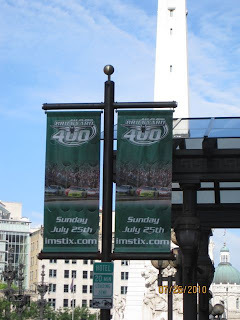 We arrived in the city the day after the Brickyard 400. Which is one of the races in the NASCAR circuit. July is a great time to visit the city, with its mild climate. I was just doing some research and the Indianapolis means "Indiana City" I thought that was interesting. The downtown area of Indianapolis is very people friendly What I mean by that is there are plenty of places to eat and entertain yourself, no matter what entertainment you are looking for. There a restaurants at all price points, movie theaters and hotels. The city was easy to navigate. Which is odd, considering the person they called to help design the city. Alexander Rolston was the designer, who assisted L'Enfant with the design of Washington DC. By contrast one of the more difficult cities to navigate. The city has also hosted the NFL combine for the last couple of years at Lucas Oil Field. (I believe that is the proper name). I found the city to be very clean for a downtown. 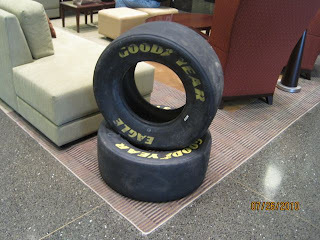 The entire city supports the different events that happen there, even in my hotel, there were racing items. These tires were in the lobby. Right across the street there was a food joint called Bodacious Bar-B-Que. The city hosts an Indy Car race also. Maybe you have heard of it, The Indy 500. Agree Indy is a fun place to visit. Have stayed in a B and B with a great front porch, but a few streets over were the sky scrapers. Love the water area. My Dad was born and raised in Indianapolis. He started going to the track when he was 6 months old. I went there last May to lay his ashes to rest. That is where he wanted to be.